Uses : Taken internally in very small amounts, the leaves strongly promote perspiration and purge the bowels the next day. The juice of the fresh herb is sometimes used for fever and to allay pain. 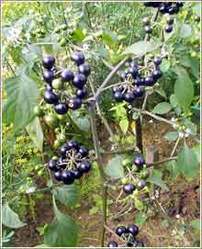 In large doses, black nightshade can cause serious, but usually not fatal, poisoning. Externally, the juice or an ointment prepared from the leaves can be used for skin problems and tumors. The berries are poisonous, but boiling apparently destroys the toxic substances and makes them usable for preserves, jams, and pies. The fruit is used as a cosmetic; rubbing the seeds on the cheeks to remove freckles. Children harmlessly and extensively eat the mature fruit. The fruit has been used for diabetes. Decoction of stalk, leaves, roots are good for wounds and cancerous sores. An infusion of the plant is used as an enema in infants having abdominal upsets. Freshly prepared extract of the plant is effective in the treatment of cirrhosis of the liver and also serves.